Fun With Friends provided a weekly social group and summer catch-up sessions for young people with disabilities aged 12-19. Activity Breaks provided sessions over the summer break for children with disabilities aged 4-12 years. Young people had fun whilst providing respite for parents/carers. The Fun with Friends and Activity Breaks (FFAB) Service comprised of two different aspects of service provision. The FFAB Service adopted a person centred approach to service delivery by a skilled staff team, in a nurturing and safe environment. Our service addressed all of the Better Breaks priority areas, complex needs, sports and active leisure, independence, transition to adulthood, diversity and under 5’s. Families could be referred to the service by professionals or by self referral. The Fun with Friends Group was a weekly social group for young people with additional support needs aged 12-19 years. The group took place during term time with an additional 4 catch up sessions delivered during the school holiday periods. 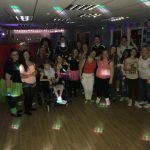 The young people were supported to engage in a wide range of activities including; cookery, summer rave, karaoke night, drug and alcohol awareness sessions, outing to the panto and an end of session party. Activity Breaks took place during the school summer holidays. These groups were for children aged 4-12 years who had been diagnosed with a disability. Each session lasted 3 hours and the children who attended were given the opportunity to take part in an assortment of planned activities such as sports sessions, summer discos, ice cream van and a disability friendly visit to the cinema. The provision of the FFAB Service has provided parents and carers with some much needed respite from their caring role. They have told us that they have used their free time to go shopping, go to the gym and spending quality time with siblings for example. Parents and carers have reported improvements in familial relationships and strengthened attachments due to the support which they and their family have received. The FFAB Project went to plan and its success exceeded our expectations. Through the delivery of the FFAB Service we have been able to enhance our knowledge, skills and practice across a multitude of areas. Firstly, in terms of project planning and budgeting we have been continuously learning and developing. It has proved vital that we have more than one activity planned in order to meet the diverse needs of service users. For example, we arranged a trip to the cinema however on arrival one of the children was distressed and didn’t want to go into the cinema. We had prepared for this and had a backup activity in place for this eventuality. This forward planning ensured that the child was able to have fun and relax engaging in an activity which they enjoyed whilst their carer had a break. We have focused on developing and forming new partnerships in our local community. This has proven to be mutual in its benefits. The service has a wide range of working partnerships with local external agencies enabling us to provide additional activities and opportunities, at no extra costs to the service. Some of these activities include sports and games to promote fitness and the chance to try something new such as cooking sessions and some expressive arts projects. Working with external partners allows the service to provide added value and increase the opportunities available. Dealing with unexpected challenges and opportunities is something that can present challenges to any project. One major challenge which we have faced was that 3-young people had to leave the group as they turned 19 years of age. 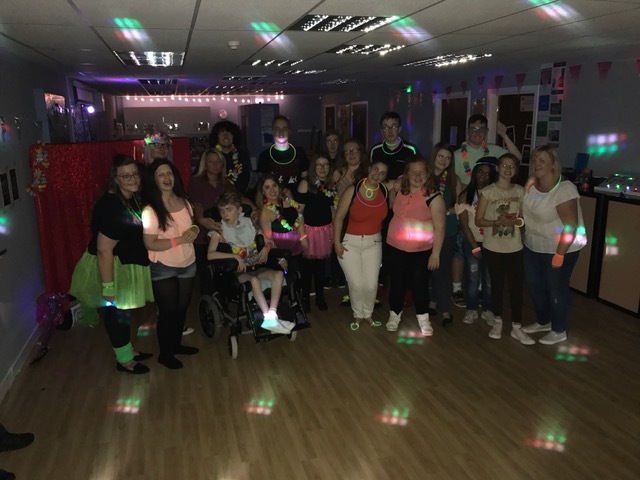 Staff worked towards positive endings with the young people but there was no other service to signpost them to that provided a similar evening social opportunity for them as young adults. Disabled children and young people, especially those with multiple support needs, will have more opportunities to take part in activities which are fun, stimulating and rewarding. Children and young people who accessed the FFAB Service were diagnosed with a disability or additional support need. Many of these children and young people had multiple additional support needs. Parents and carers reported that their children were isolated in the local community and were not able to access mainstream activities and resources. In response to this we worked with the children and young people to identify activities which they would like to take part in. Through our positive partnerships within the local community we were able to support them to access these activities and resources. For example, children were given the opportunity to attend low sensory screenings at the cinema. One parent told us that her son had never been able to sit through a film before. We supported the child to attend the cinema and the family now attend low sensory film screenings on a regular basis. Marc* is a 7 year old with a diagnosis of Autism and Quadriplegic Cerebral Palsy. Marc uses a manual wheelchair and has limited verbal communication. He requires a high level of support to ensure both his physical and social needs are being met. Marc has had multiple surgeries to try and realign his hips. This is has a great impact on Marc as the recovery process is long and limits what activities Marc can do. Marc is cared for by his mother. She came forward to the service and advised us that school breaks, especially the summer can be hard for her due to the high demanding caring role require for Marc. Marc does not have access to any mainstream community resources such as local youth groups or clubs. Marc cannot attend these sessions due to sensory needs and the level of support required. Marc attended the Activity Breaks Summer Support Sessions. These sessions provided Marc with a safe and stimulating environment which helped encourage him to join in with group games and helped him to sustain a social group setting with his peers. Marc was in the process of recovery during the summer from major hip surgery however due to 1:1 support and tailoring activities to meet his needs Marc could attend the summer support sessions. During Marc’s initial session he found it hard to focus on one thing at a time and wanted to go from activity to activity eventually going back to the beginning. Staff supported Marc to engage in activities and after exploring different games and activates they discovered Marc really enjoyed playing with pompoms. This was beneficial for Marc as he could take some pompoms with him to different activities helping him to engage and sustain activities. Marc can be very vocal and likes to clap his hands this can be a barrier for activities such as cinema screenings of movies. However there was an Additional Support Needs friendly cinema session in conjunction with our local cinema. This meant Marc could talk during the movie and there were no big crowds of people which would have made the experience overwhelming for him. This gave Marc a chance to have an outing with his peers that is adapted to meet his needs; this is not something Marc has access to on a regular basis. We identified that Marc would also require support during the October Break. Marc was supported into Additional Support Needs sport activity sessions provided by Active Schools. This proved to be a great success for Marc as he took part in all activities and appeared to be having fun whilst doing them. This provided an alternate environment that typically Marc would not be able to access due to his disability. These altered sessions were beneficial as they provided some physical activity and the chance to interact with his peers. Overall Marc really enjoyed the summer support sessions. The sessions provided Marc with the chance to experience new activities that his family could not facilitate. Marc had the chance to meet up with his peers during a time which could have been potentially socially isolating. This helped Marc to further develop his social skills in an environment which was fun and stimulating. Marc’s mum fed back to staff that she was extremely happy with the extra support over the summer as she felt Marc was in a safe and secure environment. Mum told staff Marc looked forward to attending these sessions and that she noticed a difference in Marc’s confidence over the course of the holidays. She wishes these sessions were available for every holiday period. Carers of disabled children and young people (and the young people they care for) will have improved wellbeing. At the beginning of the funding period we asked parents and carers about their wellbeing and how this could be improved. Many of the wellbeing scores were low and parents and carers reported that this was as a result of their caring role. We considered a variety of ways in which we could improve the wellbeing of the parents and carers. Families have told us that their overall wellbeing has been improved due to knowing they can access regular, well planned and safe breaks for their disabled children. This creates opportunities for other family members to have a break from their day-to-day caring commitments and spend time with their other children. We provided sessions for children and young people with disabilities which gave the parents and carers a break from their caring role. They told us that these sessions gave them the time to go shopping, visit friends, go out for meals and go to the gym. These are all activities which they couldn’t have done whilst caring for their child. Craig is a 15 year old who was diagnosed with Autism in 2005. The complexity of his autism means he needs constant supervision in order to keep him safe. He does not have awareness of dangers and potential consequences. Mum Tina is separated from Craig’s father and while he still does have involvement with the family, the main caring responsibilities are carried out by Tina. Craig also has two younger siblings who stay at home. Due to Craig’s autism he has limited social skills. Mum had previously taken him to groups however Craig had never settled in them. He often said he wanted to go home, never spoke or removed his jacket. Tina spoke about how anxious and nervous she was about leaving him. She often stayed within the building or sat in the car outside, always going back early to pick him up. It took some time to get Craig to even come into the project and for staff to build a relationship with him. This was also the same for his mum. She was worried about leaving Craig and felt guilty for doing so. She had also not had good experiences with Social Service staff in the past so was quite guarded and reluctant to talk and ask for help. At first Craig stayed for an hour and this time was built up upon. The group seemed to work well for him as he knew several other members from school. Previously he did not have many opportunities to socialise with his peers, however each week you could see him relaxing even more and enjoying himself. As Craig started to thrive in the group you could see Tina becoming less stressed about leaving him there. There was a visible difference she looked a lot more relaxed and was talking to staff more. He still kept his jacket on during group to start with, however one week he removed his jacket, this was a very significant event as it showed how comfortable he was in the environment and with the people around him. Tina could not believe that he had done this. The following week, he took his coat off and left without it!, Tina was amazed by this. She used to feel it had to be her that picked Craig up at the end of group just in case he hadn’t had a good session, however on occasion if she was out and about she asked his uncle to collect him as she knew that he was happy. Tina always gave great feedback about the group and how much that she and Craig had benefited from it. She was able to spend time with her two younger children, often shopping with them going out for dinner, or just spending a few hours to herself. She has also approached the service on a number of occasions for help and support when she has been struggling. Previously she would not have done this. This shows that the group was not only successful for Craig it was for Tina as well. Through sharing, learning and practice, there will be a better understanding of the role of short breaks in supporting caring relationships, and a better understanding of the short breaks needs of disabled children and young people, and their carers. We identified that many of the young people who attend the teenage group would benefit from activities that will improve their employability and independent living skills. Through working in partnership with other community organisations and groups we have seen that young people with disabilities are not always able to access the same social learning opportunities as their peers. As a result we have implemented workshops, including Eat Better, Feel Better and Alcohol & Drug Awareness Sessions. Through shared learning and practice we delivered sessions as part of our short break service. We have worked with these partners to share our knowledge of the young people and their families accessing the short break service to share our knowledge of the young people and their families accessing the short break service to provide them with learning opportunities which will support them as they enter adulthood.